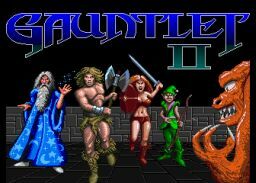 In the sequel to the original Gauntlet, up to four players at once can try to fight their way through the assorted dungeons of demons, evil mages and monsters. 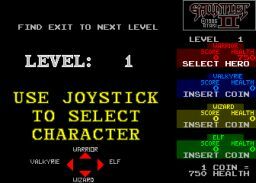 Controlling the Wizard, Elf, Warrior or Valkyrie your player must shoot the enemies while collecting the treasure and reaching the exit to the level. You then descend to a deeper dungeon where you will encounter more varied and tougher adversaries. Each of the four players you can choose has their own advantages and disadvantages, so you must choose the character you think is best suited to the task ahead. The Warrior is very strong and has the hardest shot power, but is slower to move and has the weakest magic ability. The Elf is the quickest at moving and reloading his weapon, but takes more shots to kill enemies and his magic ability is nothing special. The Wizard has the weakest shot power but the strongest magical ability, meaning he will destroy more enemies when using a magic potion. The Valkyrie is more of an all-rounder, with average shot power, movement speed and magical ability. You need to weigh up each characters' advantages and disadvantages when deciding which you will choose. As you move around the maze of passages and rooms, you will come across locked doors and treasure chests, which need keys to be opened. The chest contents are decided by which route you have taken previously and which monsters you have killed, and the prizes can vary between treasure, another key, a magic potion or even an encounter with Death himself. All of the monsters you battle are generated within a home base unique to their species, which constantly spews out new enemies. You can destroy these monster generators by shooting them, and as well as scoring points you remove the threat of new monsters being generated. There are several different types of monsters, including lobbers, grunts, demons, ghosts and even Death. Death can only be destroyed by magic potions or by teleporting on top of him, whereas every other type of monster can be killed by shooting it, although the strength of your character will determine the number of shots required for a kill. Each monster has its own characteristics, so they vary their speed and attack methods, but they all home in on you when they are with the same screen area. As well as keys, potions and treasure, their are also traps which activate when you shoot them or move over them, and these can have various positive or negative effects, ranging from removing walls in the dungeon to stunning you leaving you unable to move for a few seconds. There is also food you must collect to increase your health counter, and there is bad food and bad potions on the maze, which you should make an effort NOT to collect. Food adds 100 points and each monster damages you by removing a different number of hit points from your total You can also collect special amulets which increase your abilities permanently, such as armour, shot power, shot speed, reflective shots (which bounce off walls etc).You can get the food marked with a question mark to award you +200 health every time if you watch the last two digits of your health.If the tens digit is odd, wait for the ones digit to be 5. If the tens digit is even, wait for the ones digit to be 7. Treasure: 100 - 500 points. Each type of monster has a set score value. Each generator is worth twice as many points as its associated monster. Death: up to 6,000 points. You can shoot all monsters on screen, but any visible generators will create new monsters. Move so that the generators are off screen to give you a chance to clear the screen of all monsters. Destroy generators as soon as you see them, and move them back off screen if too many monsters are generated. If you know where the generator is located and you have a clear shot to it, fire as you move it on screen and then back away as you hit it to avoid any created monsters. Sorcerors have the ability to disappear so you'll need to time your shots to hit them when they are visible. Super Sorcerors are similar but they teleport around the screen, always appearing behind you. Shooting bad food or poisoned potions slows the monsters down for a few seconds. The contents of the various treasure chests depends on the route you take and the monsters you kill before opening it. The chest can contain treasure, a potion, a special amulet or even death. Using a potion destroys all deaths on screen regardless of which character you are playing. The score value of the deaths is of utmost importance; shooting death changes the score awarded for potioning him. The pattern is 1000-2000-1000-4000-1000-6000-1000-8000 (repeat). This sequence carries over from game to game. Stalling long enough causes the doors to open and the walls to turn into exits. It takes about 18 health (without keys) and 36 health (with keys) to stall the doors and about 325 health to stall the walls. Click here for the Gauntlet II FAQ from August 5, 1993 by Kathy Lew. It has lots uf useful tips/tricks to get some amazingly high scores.